Growing up, I had a friend named Steven whose grandparents lived across the street. I used to go over there a lot on the weekends when he was around, and most of the time we hung out in their guest room, playing Nintendo on a little 13-inch TV. One of the games that we played quite a bit was Baseball, but even then I didn’t like it. Everyone who grew up playing sports games inevitably accused the “computer” of cheating at one time or another. You’d be up by at least a score or two late in a game, and the AI would suddenly improve enough to beat you in the end. Baseball was my first experience with that, and I hated it for it. But that’s the least of this game’s problems. As it’s one of the system’s launch titles, I feel like I want to cut Baseball some slack, but I just can’t. 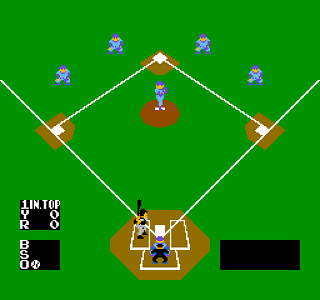 Baseball looks positively prehistoric next to any other game from the genre on the NES. Batting is alright, but pitching isn’t much fun because you just don’t have as much control over the ball as you do in other games. Whether you’re pitching or up to bat, you can’t move your player, which cuts down on the level of control. The real stinker here though is the fielding. Fielders move as though they’re wearing concrete shoes and carrying a load in their shorts. To make matters worse, balls pass right by them that they should have stopped, and once the ball rolls into the outfield it takes them forever to track it down. This is not an occasional occurrence – this happens almost every time the ball is put into play. Anytime the ball is thrown anywhere on the field, it hovers above the ground with no arc, which looks awkward. The graphics aren’t completely horrible, but it’s still the worst-looking baseball game on the system, looking more like something from the previous generation. The game doesn’t have any modes aside from 1 and 2 player single games, but that’s to be expected from an early sports title from this generation. With so many better baseball games to choose from on the NES, there’s simply no reason to bother with this one. Buy Baseball on GameGavel or Amazon. Tagged Baseball, launch, NES, Nintendo, Review, Sports. Bookmark the permalink.